A Shepherd's Heart: 8 Tips For Discovering The Will of God. 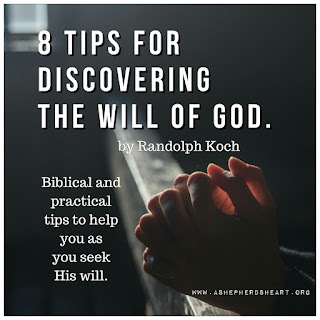 8 Tips For Discovering The Will of God. In life you may seek God's will about many things, such as: what career path you should take, what apprenticeship you should pursue, what college or trade school you should attend, where you should work, whether or not He wants you to be and stay single or does He want you to get married someday? Speaking from experience, there will be times in your life that you will seek God’s Will more often than other times. I've heard people say at times that, "God's will is a mystery, but, His will isn’t as mysterious as we think it is because sometimes it takes time to for Him to reveal it and for us to understand it so we think it’s a mystery. In fact, read the following passages for examples of how He makes His Will for you and I very clear: Romans 12:1-2, 1 Thessalonians 5:16-18, 1 Thessalonians 5:16-18, Ephesians 6:5-8. Take Romans 12:1-2 for instance, to know God’s Will, you need to reject conforming to this world and instead, allow God to transform you by His Spirit. In many passages like this, He clearly lays out His will for you and I. As you abide in His Word, you will see His revealed will because it’s very clear! God's Will is knowable, (He wants you to know His will for you), and its clear, (He will make it clear). 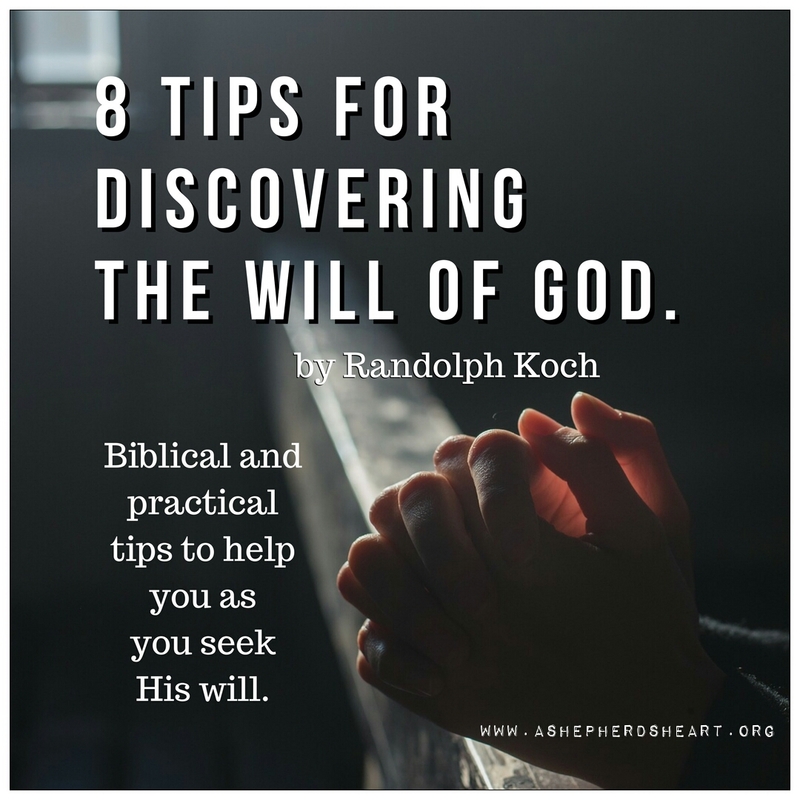 My aim in this communication is to share a glimpse of what the Bible says about His Will as well as practical tips and tools regarding about how you can figure out what His will is. This is where people often get themselves into trouble…they don’t consult God first. They press on with “their plans” and ask God to bless them later…when the direction they are on or decision they have made…may not be His will. It’s what I call the “Bless my mess” syndrome. Remember to see what God’s Word has to say about it because the will of God begins and ends with God and His Word! As you grow in your walk with The Lord, abide and are obedient to His Word, rely on His Holy Spirit day-by-day, and pray, you grow to know Him, to be more like Him including His mind. We will understand Him more including His Will for us! Prayer in all things should be a first response and not an afterthought or knee jerk reaction. You should have confidence to approach Him first and know He’ll comfort and direct you! We think we know God’s will but sometimes, again, we press forward with “our plans” then we realize things aren’t going well because we didn’t start by seeking His counsel and the wise counsel of others. We forced "our will" because we want what we want sometimes but our will isn’t always aligned with His will. Furthermore, you can’t always trust what feels “right” either because sometimes what feels right at that moment very well may not be God’s Will or it may be against His will and Word. Again, what Feels Right doesn’t always mean it’s God’s Will. Actually listen. Listen to God’s Word and godly Counsel. Don’t get ahead of God. Wait for Him. The Holy Spirit will help you understand God’s will for you! Even when we don’t have the words and don’t have it all together…The Spirit of God as at work on our behalf! Again, this applies even when we’re seeking God’s will! God’s will and timing are not our own. He may not answer or direct you right away but He will in time, so, keep seeking Him! There also may be times when He gives you immediate answers as His will, will be clear! You have to ask yourself, Do I want His best for me or not? His will is worth the wait! 1. Is what I am considering against God and His Word? If something clearly contradicts God’s Word, then it cannot be God’s Will because God will not contradict Himself. 2. Is what I am considering going to glorify God? Bonus: What about the times when you’re presented with 2 or more options that are all Good or Neutral options? These are times you still seek God and His Word for Wisdom and direction but He seems silent and leaves the choice up to you. He knows you will make the right decision. I'd also submit to you that God is never really silent. Why? Because He's always speaking to us through His Word and His Holy Spirit's guidance. God knows exactly what you’re facing and He wants to help you understand His Will for you and He’s given you tools to do so!! He knows the outcome because it’s His will! Please always remember that discovering God’s Will, again, begins and ends with God and His Word. Let me encourage and challenge you to seek The Lord First, seek His Word often, seek Him through prayer, seek wise counsel, and follow the leading of The Holy Spirit…by doing so…God will help you understand His Will for you! P.S. Please pass this encouragement on to others. Thank you for this post Randy. I sometimes forget some of the practical steps involved in SEEKING and LISTENING. Thank you for your encouragement and taking the time to leave a comment! It often comes down to the "basics" and the practical things we forget to apply sometimes. :-) We all need refreshers as sometimes we get in the way of our own progress because we can overthink or over-complicate things...but God's grace is greater! He will guide us as we seek His will! Hoping this post, while more of a overview, will spur us along in studying God's Word further for ourselves. All the best! Thanks again! Thank you Randy, this really hit the spot. Not just for today, but for things I've been struggling with recently, and will be facing even more so head-on here very soon. May God continue to bless the work you are doing, I will surely pass this along as well. Hello and thank you for taking the time to share. Glad this was helpful. It just scratches the surface and I hope it spurs us on to steady all the more through these practical tips. Thank you for your encouragement and thanks for passing this along! Honored to serve the body of Christ! He Is Risen!! Resurrection Sunday 2018!